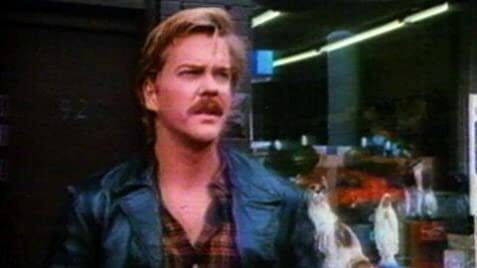 John Dakota is young bum with a hidden past. He meets a nice family and works on their ranch. He soon becomes a good friend of the disabled son and helps them overcome local problems. Buster McHenry: Look over my shoulder and tell me if you see an Indian following me. "I'm a police officer. I was working undercover." 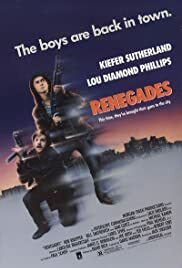 After appearing in "Young Guns" a year earlier, Kiefer Sutherland and Lou Diamond Phillips would reunite again in this very clear-cut and wry, but well executed chase action thriller by director Jack Sholder (The Hidden '87'). Quite a cosy formula with no surprises, but the taut action when it erupts is blistering (from the frenetic shoot-outs to the intense chase scenes and the death by flaming spear). While Sutherland (reckless) and Phillips (spiritual) make a fitting combination, where the two go after the same criminal (for different reasons) and from that learn a mutual respect for each other, despite a bumpy first meeting. Robert Knepper malevolently hams it up in the villain role with cold glee. An undercover maverick cop is left for dead after a diamond heist, but is saved by a Lakota Indian who needs him alive as a sacred lance of his people was stolen by one of the robbers who also shot his brother. So now the two team up, unwillingly at first, but differences aside they realise they are after the same man. Enjoyably no-nonsense, filled with high energy and snappy dialogues as we watch how two opposites attract. The story is well meaning in its context; sharing some light on the Lakota Indians and the typical angle of honour/revenge. Traditional, but unassertive. Also showing up is Jami Gertz in nothing more than a minor sense. Schematically earnest late 80s action thriller. "I'm a punk and you're a dirty cop."